The Enemy of My Enemy's Friend is My? The historical record on this Pale Blue Dot, as the deceased astro-physicist Carl Sagan once deemed the Earth, has been fraught with violence and war. Carl Sagan used the Pale Blue Dot nomenclature as a metaphor to humanity in order to reflect on the infiniteness of the universe and subsequently the Earth's place within this vastness. When Voyager 1 took its last instructed photograph as it exited our solar system, that speck of blue in the lower left corner was the place where everything and everyone we know happened. There dangling in space was the epicenter of our history which constitutes only a fraction time in the space time of the universe. The present day infighting amongst various religions, some which have emphatically entwined lineages, only strengthens the concept sent forth by Carl Sagan. Violent clashes between groups of people is sadly endemic to the human species. Taken to the extreme war then becomes the penultimate expression of violence between groups. There is a biology infused anthropological premise that resources and access to them precipitates groups to resort to violence. This theory is called the “protein theory” which romantically applies to hunter gather societies. Societies which Rousseau labeled the “noble savage”. In the modern age not much has changed in the way of motivation which sways the “noble savage” to conduct violence in the form of war. Yet as societies developed more abstruse ways of differentiating themselves from other societies their intrinsic motivations also evolved. Of course, the fundamental reason might be an overextended population which was in competition with its neighbors for resources. But with an extended philosophical and metaphysical palette the society could paint a richer and more convoluted rationale for war. The desire for the “US” feeling is defined by psychology as a sense wanting to identify and belong to a group. A sense of “brotherhood” is this psychological concept as it is borrowed and tweaked by sociology when they apply it more widely to societies. Brotherhood is a term with a thousand faces. It can allude to nations, subcultures, secret societies and even ethnic groups. However, the one pervasive group throughout modern history which the concept brotherhood is inextricably linked is that of religion. From the Christianization of pagan Europe through to the bellicose clashes of Europe and Asia Minor during the Crusades then the upheaval of the Counter Reformation when the Catholic Church attempted to reassert its hegemony over Christian doctrine, modern history is defined by the careening of ideologies wrapped in the concept of brotherhood. It is not a level of sophistication which mans the wheelhouse of derision between brotherhoods and leads them to war. Rather, it's an inability to collectively gaze at the Pale Blue Dot. Sometime before the Neolithic Revolution about 12-13,000 years ago disparate groups were able to meld their sense of brotherhood and create a landmark to religious unity. They accomplished this without the aid of a priest class or arcane philosophical tenets. These devices enable a modern stratified society to set parameters for the brotherhood concept to function. Yet the earliest religious temple built tells a different tale even if the scientific community isn't able to see the Pale Blue Dot. 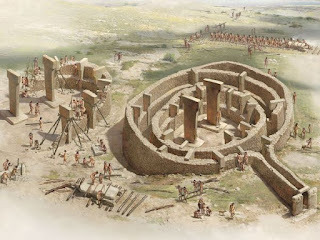 Göbekli Tepe is the earliest sophisticated temple constructed by man before the neolithic revolution which belies a level of sophistication and societal diversity that wasn't developed for thousands of years later. From the weird to the wonderful a handful of theories have been postulated for the sociological quantum leap. The theories run the gamut from a benevolent extraterrestrial assistance to a culmination of hitherto undiscovered advancement in technology and familial cohesion. Science and scientific discovery are driven by a conjecture motor made up of guess work and hunches. The allure of unraveling a mystery by using an avalanche of intricate data and detail often befuddles the basal goal which is to explain. Sometimes removing the cadre from scientific protocol is what is truly propels knowledge and discovery. The refocussing on more concise and simple explanations will facilitate the development of ones which prove to be the most plausible. This is sometimes referred to as Occam's Razor which posits that if you are confronted with two competing theories the simplest of the two is usually right. Put another way, if you are able to think outside the box you might be able to see a container. So what is Göbekli Tepe? Why is it a mystery? How does it shape and mold our perception of the sociological and anthropological leap forward? As will become apparent; the enigma wrapped in a mystery is also cloaked orthodox scientific paradigms which untangle neatly when we slice them open with Occam's Razor. The theory goes that the evolution of a nation state journeys through immutable phases until it reaches it peak of a stratified society. The domestication of plants and animals theoretically frees the entire clan/tribe from necessarily foraging and hunting for food. A key factor is that it call in a de facto cooperation mechanism with strangers. In the case of Göbekli Tepe it was a shared codified belief system presumably in an afterlife. The fact is that there had to have been a fully functioning cosmology beyond a basal animistic/totem belief. The complexity of the temple suggests that a diverse array of animals and demigod like deities existed in their shared cosmology because of the wide variety of stone carvings. But they were not a settled, stationary society. My claim is they were semi-nomadic and came together during an immense abundance of food stuff which grew naturally around the area of Göbekli Tepe. The climate did not afford the builders of Göbekli Tepe to remain year round in this place and thusly they convened only during the more hospitable weather months. The fact is that they needed to have time and expertise to practice and perfect these new building techniques and artistic trades. No social or evolutionary advancement occurs in a vacuum. But how did they acquire the technology to carve and build? Moreover, why are there no jewelry or ornamental beads or adornments found in situ? Clearly, if they were able to produce the carvings they should have been able to make animal bone necklaces or trinkets like totems or tikis to travel with on their semi-nomadic treks to warmer climes during the winter and autumn? Perhaps several different ethnic groups gathered in the same area and the same time during the wet and cold months of the year. During these periods they were able to swap technologies and stories and building techniques through diffusion or enculturation. These accomplishments were made with basic stone tooled flint flake technologies. The point is that the temple was constructed and it was done so outside the confines of orthodox scientific theories. To illustrate the axiom of Occams Razor as it applies to the confounding theory of how Göbekli Tepe was erected a brief overview the Calusa Indians of Florida will be discussed. The Calusa Indians society will prove that a fully developed an functioning stratified post Neolithic Revolution society is not required to evolve culturally. Of course there are other examples, like the Monte Sano Middens in present day Louisiana or the dissemination of Polynesia culture from the Marquesas Islands, but for sake of space I have limited it to one example. The Calusa were a people who inhabited the coastal regions and interior waterways of Southwest Florida from about 5000 BC until the Spanish encountered them on their explorations in the early 1500's. The Calusa had a vast kingdom built upon a tribute system to a single chief who had many thousands of subjects encompassing a huge amount of territory. They erected large religious middens and settlements as well as waterways for irrigation and transportation. These accomplishments seem tame almost benign at first glance. However, all of these advancements were made without sedentary farming and agriculture. The Calusa culture, also referred to as the Caloosahatchee culture, was based on estuarine fisheries. This means to say that the classic model employed by scientists to trace the evolution and therefore the ability for complex societal endeavors is turned on its head. In other words, similar to Göbekli Tepe there was a “goldilocks” scenario in the region where the climate was right for staying in one place. The Calusa didn't construct anything quite on the magnitude of the religious edifice found at Göbekli Tepe but they did prove that the evolution of societies are like snowflakes; each one is unique. So what does this tell us about brotherhood and war? The commonality of the human experience is what binds those details of that experience, like religion, culture and brotherhood. But what binds us more as we move forward is the global brotherhood we share as we gaze in our minds eye at the Pale Blue Dot.